Francis Antenna line of quality CB Radio antennas are pre-tuned from the Francis Antenna factory so you can easily and quickly mount it without the hassle of tuning it to your truck or vehicle. 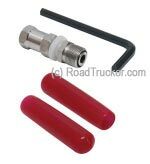 Francis superior Fiberglass CB Antennas at RoadTrucker are carefully selected to meet your needs. We have the Francis Double Quarter Wave Antennas from 100 Watts to 225 Watts - Hot Rod Series. These antennas are designed with traditional sleek style that reduces wind drag load. With Custom Fiberglass Formula for Flexibility and Durability. Get the 150-watt Francis Hot Rod Series Antenna - pre-tuned for maximum performance. With exclusive double helical winding sealed inside fiberglass for long life and durability. Available in orange, black or white. The 3′ Francis CB22 CB Antenna is flexible and long lasting CB antenna with its Double Quarter Wave Fiberglass Formula and Chromed Brass Ferrule. Designed with traditional sleek style that reduces wind drag load. With 3/8" - 24 Threaded Base to accept all standard antenna mounts.